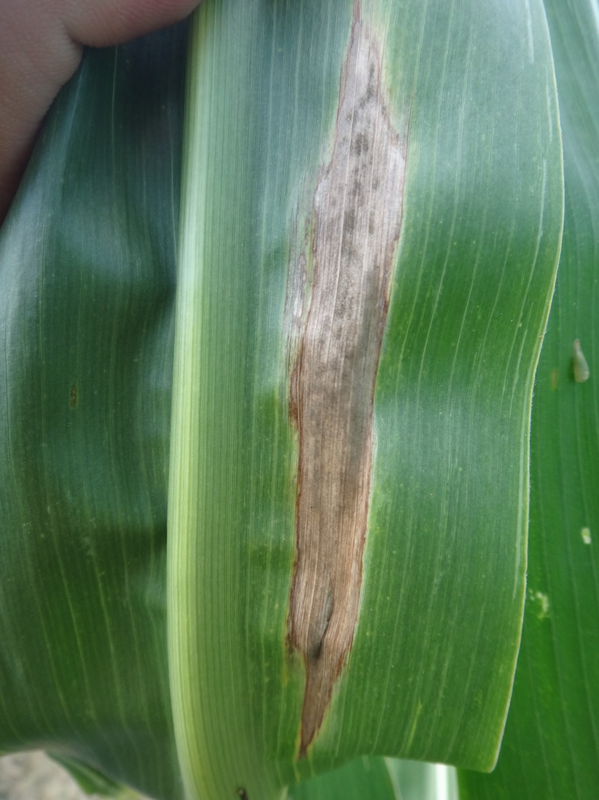 Northern corn leaf blight (NCLB), caused by the fungus Exserohilum turcicum, is one of the most frequently occurring foliar diseases of corn in Ohio and the Midwest in general. Since the early 2000s, both the prevalence and severity of this disease have increased, but in most years plants only becomes severely diseased well after silking. During wet weather yield losses may be as high as 30-50% if the disease becomes establishes before tasseling. However, if leaf damage is only moderate or is delayed until 6 weeks after silking, yield losses are minimal. Severe damage caused by NCLB also predisposes plants to stalk rot and lodging, which may further reduce yield and grain quality. The characteristic symptom of northern corn leaf blight on a susceptible hybrid is one-to-six inch long cigar-shaped gray- to tan-colored lesions on the leaves (Fig. 1). However, before lesions are fully developed, they first appear as small light-green to grayish spots approximately 1-2 weeks after infection. As the disease develops, the lesions spread to all leafy structures, including the husks, and produce dark gray spores, giving lesions as dirty appearance. The lesions may become so numerous that the leaves are eventually destroyed, causing major yield loss due to reduction in the available of carbohydrates to fill the grain. The leaves then become grayish-green and brittle, resembling leaves killed by frost. Lesion characteristics may vary among hybrids based on their resistance and interaction with different races of the pathogen. Several physiological races of the fungus are known to occur, including races 0, 1, 2, 12, 23, 23N and 123N. Two types of resistance are available to protect against these races: partial resistance (non-race specific), which is controlled by multiple genes and protects against all known races of the fungus, and race-specific resistant, which is controlled by single Ht genes (Ht1, Ht2, Ht3, and HtN) and, as the name suggests, protects against specific races of the pathogen. Partial resistance and resistance conferred by HtN are expressed as a reduction in the number and size of the lesions, whereas resistance conferred by Ht1, Ht2, and Ht3 is expressed as small chlorotic lesions. A compatible interaction between Ht genes and races of the pathogen results in a susceptible lesion type—large necrotic cigar-shaped lesions (Fig. 1)—whereas incompatible interactions result in small chlorotic lesions (resistant lesion type). For instance, race 1 of the fungus causes large necrotic cigar-shaped lesions on hybrids with Ht1, but small chlorotic lesions on hybrids with Ht2, Ht3, or HtN. The fungus causing NCLB overwinters as mycelia and conidia on corn residues left on the soil surface. Conidia may also be transformed into thick-walled resting spores called chlamydospores. During warm, moist weather in early summer, new conidia are produced on the old corn residue and carried by the wind or rain to lower leaves of young corn plants. Infection and disease development are favored by heavy dew, frequent rainfall, high humidity, and moderate temperatures. Infection by germinating conidia occurs when free water is present on the leaf surface for 6-18 hours and the temperature is between 66 and 80°F (18-27°C). Under favorable conditions, lesions develop and produced a new crop of spores within 7-12 days on susceptible hybrids, causing the disease to spread rapidly. Secondary spread from lower to upper leaves and among plants within a field results primarily from spores being splashed around by rain, whereas wind is responsible for long-distant spore movement and spread of the disease from one field to another. Planting resistant hybrids is the most effective method for controlling NCLB. Partial resistance protects against all four of the known races of the fungus and reduces the rate of disease development by reducing the number and size of the lesions and the amount of spores produced in these lesions, as well as increasing the length of the incubation and latent periods (time taken for new lesions to develop and produce a new crop of spores). Race-specific resistance protects against specific races of the fungus, reducing disease development by producing chlorotic lesion with limited and delayed sporulation. Partial resistant hybrids are the most common, but hybrids with both types of resistance are available. Resistant hybrids should be planted in all commercial dent corn production fields. Select hybrids with high levels of partial resistance in combination with Ht1, Ht2 or other Ht genes. A one- to two-year rotation away from corn and destruction of old corn residues by tillage will be helpful for controlling NCLB. Fungicide sprays are recommended for fresh market sweet corn, hybrid seed production, and dent corn fields planted with susceptible hybrids. The spray schedule should start when the first lesions appear on the leaf below the ear on 50% of the plants. Applications made at tasseling or silking (VT/R1) provide the most consistent results in terms of disease control and yield response. Several fungicides are available for use on corn for NCLB control. Read labels for rates and follow application directions which vary with each fungicide product. Copyright of this article by The Ohio State University. We are sharing and promoting the market innovation.